Caves, dungeons and dungeon like interiors. (starting from the Forest Temple) Also in places of the dead. These are some weird witches that are made of residual magic from long ago. Wrapped in cloth and with pointed hats, they scare any passerby. These creatures can suddenly appear on your path. It follows the MC design. Garbed in cloth and have a pointed hat. Their faces are mostly invisible except for two white blinking eyes. Their dark clawed hands are only visible when raised to the sky. This variation has green as its primary color. When there is only one it appears on either the vertical height or horizontal width at a random distance that Link is on. 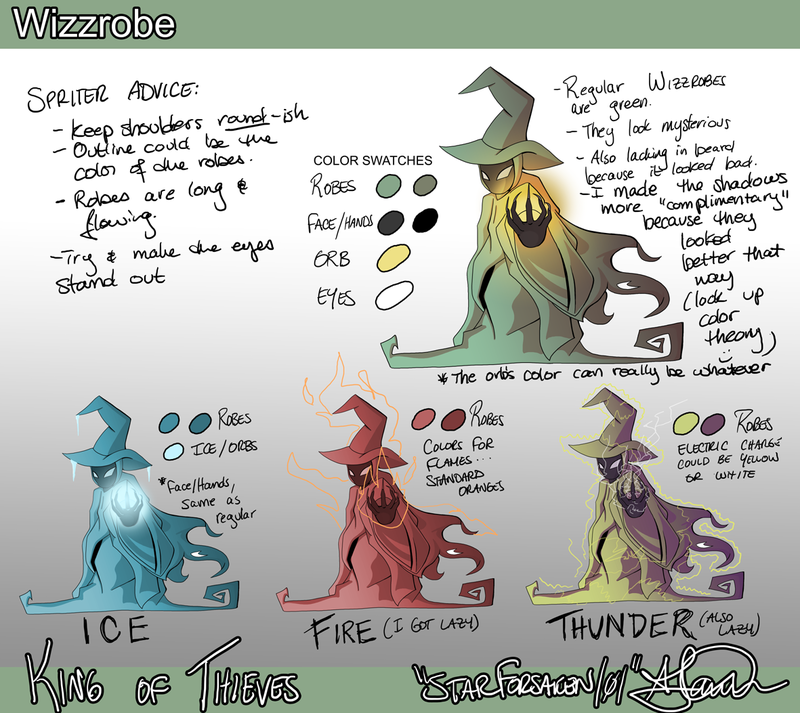 With multiple wizzrobes (variations) one or two will position themselves on the same horizontal width or vertical height as the player, while the rest take a strategically back up position. When they appear they shoot a magic projectile in the horizontal or vertical direction of Link (depending on his position). They linger for a while before they disappear again. They stay gone for a random (between 5- 10 second) amount of time. Unlike the MC design they appear and disappear in a puff of smoke. The more damage they receive shorter the time is that they linger before disappearing and shorter the time is that they appear again. Defeating: Weapons have their normal effect on wizzrobes. The ice and fire arrows kill these bastards with one hit. A shadow clone has only 50% chances of distracting them. .25HP They appear in a place and stay there visible for a while. If Link is there when they appear or he just walks into them he receives damage. .5HP A small wave of magic (projectile) shot in the direction of Link. The projectile size is about 24 pixels. And the projectiles are not bothered by obstacles. This page was last modified on 27 February 2013, at 13:41.